FRIENDS AND MEMORIES ARE FOUND! 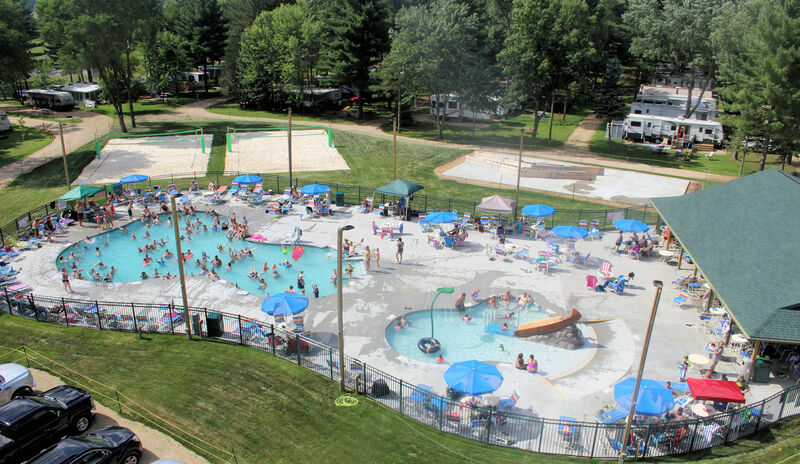 Family owned since 1965, Indian Trails Campground has become the most celebrated destination for its wide range of family activities offered in one natural setting. See the sights, climb new heights, sleep under starry nights… and discover why so many families make Indian Trails a yearly tradition! Discover scenic hiking and biking trails, fishing and river paddling trips or a leisure game of mini-golf. Cool off at two new outdoor heated pools, at the swimming beaches, or in the spacious indoor heated swimming pool. Explore four fun-packed playgrounds, two bark parks, ball courts, on-site eateries and movies under the stars! We know how important it is to experience the comforts of home while vacationing with your family. That’s why we offer cozy cabin rentals with amenities plus three nearby fully equipped bath houses with free showers. Kids can also camp in an authentically designed Sioux tipi. RV travelers can enjoy unlimited camping during open season. What’s more, we offer FREE camper storage up to 14 days in between your visits with us. Tent campers can also opt to rent one of our fully equipped teardrop campers during rainfall, sure to keep you comfortable and dry.